As the last week of classes comes to a close, many students are studying for and anticipating their final exams. To offer a break from the studying and celebrate the end of the semester, the show choir group Routine Disturbances will be holding one last performance to end classes with a bang. “It’s kind of our theme to have power for girls, ” Kesel said. In past performances, the group performed songs from “Matilda, ” “Guys and Dolls, ” “The Addams Family” and more. This semester, the group decided to embrace the unusual change to all women by choosing songs reflecting femininity and female power. The choice of songs was a collaboration of everyone in the group, keeping in mind what songs worked best with their vocal arrangement, Kesel said. Currently, the group has 11 performers, plus four people on the executive board. Kesel said while not all of their members have backgrounds in music, they take whoever has the most appealing voice and dance moves. Freshman music education major Brittany Mechler chose show choir to continue doing what she enjoys in an environment with like-minded individuals. “I did show choir all throughout high school, and I really missed it when I came here, but I knew there was an opportunity for it, so I found it at the club fair and signed up, ” she said. 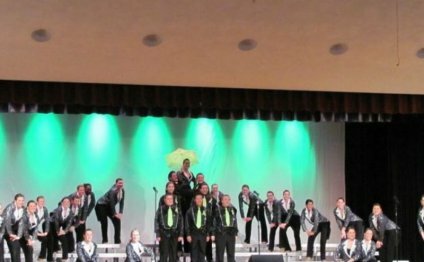 For Mechler and others, show choir is an alternative to auditioning for one of the college’s plays, especially for those who enjoy singing and performing but are not musical theater majors. Sophomore theater arts major Valerie Shvedok said rehearsal has been busy for the upcoming show, but members can choose their commitment level. AZ All State Show Choir 2012 #1 "Songs"